Home Life Pro and Con of Vaping: Should You Start Vaping? Vaping has gained popularity as the supply of vape pens in the market has increased. Vaping is viewed as an alternative to smoking tobacco cigarettes. Should I take a tryout of vaping? If you have asked yourself like this, knowing the benefits and drawbacks can help you make a wiser decision. Here are the details of pros and cons of vaping. Traditional cigarette pollutes the environment and is harmful to both the smokers and nonsmokers around them. Vaping minimizes the harm by reducing your exposure to tobacco and lowering production of smoke to the environment. One cigarette contains over 4000 chemicals which include 400 toxic chemicals harmful to human health and 43 carcinogenic compounds. The chemicals range from arsenic to formaldehyde. However, vaporizers reduce or even eliminate all the chemicals. Smoking exposes smokers and people around to the smell of tobacco. The liquid in a vaporizer is scentless. It does not release any smell to the environment. Traditional cigarettes produce smell that remains in the smoker's clothes and skin for a long time. Hence, smokers have to wash their hands every time they smoke a cigarette and wash their clothes every day to rid the smell. Vaporizers eliminate this hustle. In addition, the inhaled fluid within vaporizers is colorless, which avoids the staining of the smoker's finger and teeth. Vaporizing does not involve any burning and this protects the smokers' skin. Vaping liquids have different flavors to satisfy different tastes. Smokers can choose the same flavor of vaping liquids as their favorite cigarettes. For instance, smokers who prefer menthol cigarettes can use menthol vaping liquids. Those who prefer traditional cigarette can enjoy tobacco flavored vaping liquids. The vapor is scentless despite the flavors of the vaping liquid. As the topic "pros and cons of vaping" says, in addition to the advantages, there are still some disadvantages of vaping. One of potential drawbacks of e-cigarette is the lacking of government regulations on e-cigarettes. Therefore, it is hard to tell whether the approaches and the quality of the e-cigarettes are safe or not. You can buy any e-cigarette flavor online without limitation or paying any taxes. The FDA announced in 2012 that it could change the regulations on tobacco products including e-cigarettes; however, there is no certain date about the changing so far. Some states such as New York, Los Angeles, and Boston have already introduced new laws on the sale of e-cigarettes. Similar changes in regulation might be introduced in the future. The FDA proposed to extend its authority to e-cigarettes and other tobacco products. Among the new regulations from FDA is a minimum age requirement. 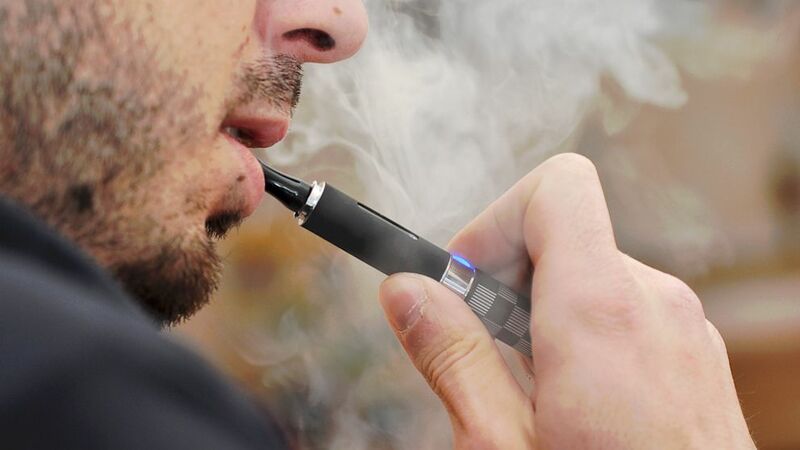 Although vaporizers offer smokers an opportunity to choose a vape liquid or e-liquid that has no nicotine, there are no specific standards and confirmation on the e-liquid due to the lack of regulations. Some companies offer e-liquids with nicotine, which makes it difficult for consumers trying to overcome the addiction to nicotine. Such products only replace the cigarette with a vaporizer but retain the amount of nicotine. Therefore, consumers just continue to maintain their nicotine intake but avoid the chemicals found in cigarettes. E-cigarettes have potential side effects such as dehydration. Propylene glycol in the e-liquid can absorb and retain water, leading to dehydration. Some smokers might also be allergic to propylene glycol. Besides the propylene glycol, nicotine has negative effects on blood sugar and the circulatory systems. It is addictive and dangerous when pregnant or breastfeeding. Seek your doctor's advice before using e-cigarette or avoid vape liquids that contain nicotine. There are many reports of battery explosions due to unconfirmed sources of e-cigarettes. One such report was on CBS News where a man was injured when his e-cigarette battery exploded. His tongue, mouth, and teeth were severely damaged. Using any battery including a mobile phone, car or computer battery is risky. A battery can explode at any time even when using an e-cigarette. Just consider the possibility of a battery explosion when evaluating the pros and cons of vaping. There are many cheap imitations in the market. A very cheap vaporizer is most likely an imitation. Some of the vape pens combust marijuana instead of vaporizing the THC. Just remember to be careful and cautious and do not waste your money on imitations. Do not start vaping if you do not smoke. Vaping has many heath risks and no benefits. Do not turn to vaping to help you quit smoking. Instead, instead, consider any of the FDA approved methods to quit the habit. There is no evidence proving that e-cigarettes are effective on quitting smoking. You can move fromtobacco to e-cigarettes if you do intend to quit smoking. Consult your doctor before switching and learn about their risks and benefits.